You know what’s weird? Typing on your phone. We use two thumbs to peck out words on a keyboard designed for ten fingers—a keyboard designed to be slow. You know what’s weirder? 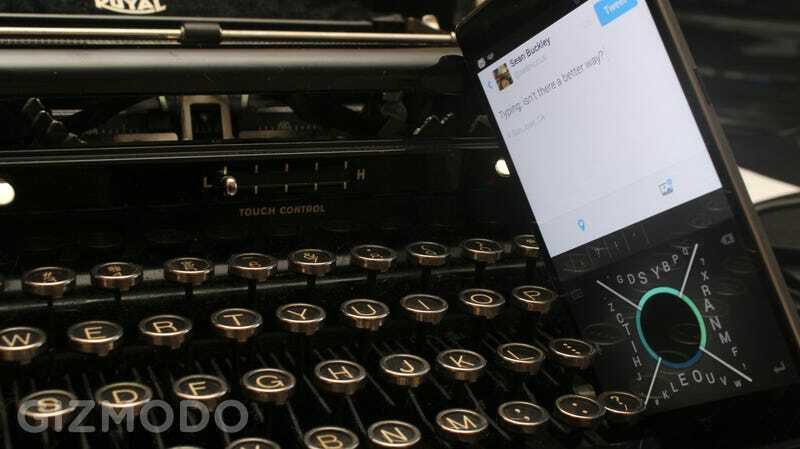 Smartphone keyboards designed to trump our flawed typing standard. Here are 12 of them. You probably don’t know it, but there are loads of alternative smartphone keyboards lurking out there in the app marketplace, or on Kickstarter and its ilk. They all have the same battlecry: QWERTY just wasn’t designed for two thumbs typing on glass. It’s not like anyone would disagree—we use predictive text correction algorithms just to make using a full keyboard in a 6-inch (or smaller) space bearable these days. The only reason we don’t have anything better is because change is hard. If you’re willing to re-learn how to type, though, you’ve got a lot of options. Let’s check ‘em out. Want to cut your 26-key keyboard down by oh, about 17 letters? Check out MessagEase, a keyboard with just nine basic keys. Each key is its own letter, but swiping away from it in a specific direction (marked by another letter, of course) produces a different character. The company says its best typists can get up to 80 words per minute and, well, I almost believe them. This is one of the few keyboards from this collection I actually installed myself, and it’s highly usable with a little practice! Just remember to turn on predictive text and go download a wordlist: it’s a chore to type out each individual letter. This is probably the most ambitious smartphone keyboard I’ve ever seen: it’s not just a rearrangement of letters and keys, but a gesture-based system that wants to redefine how we learn to type. You can use simple taps and swipes to peck out individual letters on its two touchpoints, but it’s really designed around memorization. The grid system allows for thousands of unique gestures, and CrossTap’s maker wants every word in the English language to have its own gesture. “Type with words,” he says—just like how you talk. It’s a crazy coco-banana idea. Properly learning the system would take years of memorization. It would need to be widely adopted and integrated into basic education to have any chance of success. But hey, what’s innovation without ambition? Sadly, this is one you can’t try—CrossTap only exists as an internal prototype for now, but if the project’s Kickstarter succeeds, it might eventually surface as a real keyboard. This keyboard looks kind of like a rotary phone—looping the alphabet around a circular spacebar key in two rows. It’s designed to curve to the natural sweeping motions of your thumb and reduce the amount of distance your digits need to travel to tap more commonly used letters. It’s available for iPhone right now, but the creator is hoping to get enough funding via Kickstarter to continue developing it. Looks kind of like the superhero dial from DC Comics’ “Dial H For Hero” doesn’t it? Okay, maybe gestures aren’t your thing. What about piano chords? That’s the idea behind the chorded keyboard: a typing system that utilizes specific button combinations (or “chords”) on a limited set of keys to reproduce any keystroke. It’s a weird idea, but it isn’t new: Douglas Engelbart, inventor of the humble computer mouse, helped introduce the idea way back in 1968. It didn’t catch on. That shouldn’t stop you from enjoying the innovation now, though—the Chorded Keyboard GKOS Android app offers big, friendly, chorded buttons. It’s pretty easy to use, assuming you can memorize the layout: tapping any button will type it’s prescribed letter while holding a button changes the functions of the buttons around it. I can’t say if it’s a good full-time keyboard replacement, but at the very least it’s a cool look into computer history. Don’t let the name fool you: writing on the EZ Gesture keyboard is neither easy or gesture-based. Instead, the app provides you with a grid of nine circles that you can use to draw right-angled caricatures of letters and numbers that sometimes turn out to be the character you were looking for. It’s kind of like handwriting recognition, but less intuitive. Want something with a shallower learning curve? You’re looking for FlickKey. This keyboard features a layout similar to (but not quite exactly like) QWERTY, but favors quick, 8-directional flicks over button presses. In fact, it’s the only non-QWERTY keyboard on this list I was able to use right away …though I can’t say that it’s actually better than my SwiftKey standard. It’s too redundant for my smartphone but it has potential as a smartwatch keyboard. FlickKey is based on the idea that it’s more accurate to flick a “large” key than try to touch a small key. Can’t flick fast enough? Don’t worry — predictive text contains thousands of words that are available with the flick of a finger, presumably speeding up typing and taking a shorter distance in on-screen dragging to complete a sentence. One of the worst things about cramming a full-sized keyboard into a small space is how cramped things get. It’s easy to tap the wrong key and let autocorrect run rampant with your mistakes. Some keyboards solve this by simply taking up more space: KeyZag Keyboard, for instance, places the normal QWERTY layout on a zig-zag offset to give each character ample room to touch. It’s a decent idea, but I found that it woefully incompatible with my QWERTY sense memory—I might as well learn one of the more radical layouts above. Adaptive key-size keyboards like Thick Buttons and Dynamic Keyboard were a little easier. These keyboards use predictive text to change the size of the keyboard keys as you type—making the characters you’re most likely to use next larger and harder to miss. I like the theory a lot, but found the morphing keys distracting and too slow for my (unabashedly braggable) fast fingers. If making QWERTY bigger doesn’t work, what about making it smaller? Not without a badass auto-correct algorithm—but that’s the whole point behind the Minuum keyboard. This app reduces the smartphone’s input down to a single line of letters and somehow, through some magic algorithm, corrects all of the mistakes caused by this deceptively inefficient layout. I don’t know how, but it’s shockingly good. I just kept having to catch myself from moving my fingers up and down to “rows” that no longer existed. There are a lot of good, innovative keyboard ideas here, but they all suffer the same fatal flaw: they use letters and numbers. Is that the future of online communication? Of course not. The forward thinker knows exactly what to do—skip to an enviable future where all communication happens through meme-based moving pictures. That’s exactly what PopKey Animated Keyboard offers. After all, if you can’t say it with a GIF, is it really worth saying at all?